Cydney Sampson will reign over the weekend festivities as Miss Foothills 2018. She is the daughter of Tim and the late Elaine Sampson. It’s a little hard to believe that a year has come and gone since Clinton County had one of the largest and most entertaining weekend celebrations on the square with Foothills Festival XXXVIII. But sure enough, a full round of seasons have come and gone, and here we are, once again set to host our main outdoor fall celebration of the year and welcome the world to Albany and Clinton County for this weekend’s Foothills Festival – version XXXIX. Come See It Our Way! Just one celebration shy of a four-decade long run – 40 years, this year’s 39th Foothills promises to – weather permitting – hold true to the goal that has long kept the event planners searching for ways to keep goers entertained, bigger and better. Although the weather forecast for the upcoming weekend is one that Foothills Festival Planning Committee members might choose to tweak somewhat if given the opportunity, it is, after all, a typical fall outlook. According to the National Weather Service, a jacket, cap and even an umbrella might be in order to help fend off what is said to be the likelihood of possible scattered showers both Friday and Saturday. Friday’s forecast calls for a 50 percent chance of showers, mainly after 1:00 p.m. with mostly cloudy skies and a daytime high near 64 degrees. Friday night’s outlook for both the parade and the main concert offering of the weekend – Exile – is for temperatures to be around 49 degrees but an increasing chance of rain as high as 80 percent. Saturday’s outlook is about the same, with a 50 percent chance of scattered showers throughout the day with mostly cloudy skies and a high of 59 degrees, dropping to a low of 37 degrees Saturday night. Local residents know all too well, however, that weather forecasts in this area of the country are subject to change and hopefully that will be the case for the upcoming weekend – for the better. Still, it’s a celebration that has gone on here for nearly four decades, and seldom – in fact maybe only once or twice, has the weather forced a complete wash-out of our beloved event. Bundle up, come out and enjoy the fall weekend lineup of Foothills events, activities and entertainment. While the bulk of the events and don’t miss happenings are set to hit the stage and streets Friday and Saturday, there are a couple of early events still left on the slate that you will want to take note of. On Wednesday evening (October 17), the community will come together for a “Service on the Square” joint worship event, sponsored by the Clinton County Ministerial Association. The first time (last year’s similar time slot was billed as a Gospel Singing event) Community Worship Service will get underway at 6:00 p.m. near Stage 1, located in front of Albany Baptist Church. Local merchants around the Albany business community are reminded of this year’s Foothills Window Decorating Contest, with judging to take place Thursday evening. Get those windows ready and be sure you’ve contacted Jay Garner (606-306-0469) to tell him you want to be included in the judging process. For the most part, the weekend of fun and Foothills excitement gets underway beginning Friday, as the arts and crafts displays and food court vendors begin setting up and opening for the two-day long gathering all around the square and in the food court area, behind the Foothills Festival building. Many of the main events on the schedule will again take place either on or near the two main stages that are set in their familiar locations. Stage 1 events are near the food court area on west Cumberland Street in front of Albany First Baptist Church, while events on Stage 2 are on East Cumberland Street, near the law office of David R. Choate. Friday’s fun gets underway early, especially for the younger Foothills crowd, with the opening of the Pumpkin Patch games and inflatables, near First and Farmers Bank. Open all day except during the afternoon Foothills Parade, a full day inflatable pass is only $5. Arts and Crafts will be open for business beginning at 10:00 a.m. Friday, offering a “festive” lineup of goods and souvenirs, many home crafted and a few right on site while you watch. At 12:30 near Stage 1, the concert setting performances by the Clinton County High School Band and the Clinton County Alumni Bank will feature another traditional crowd pleasing musical treat to the Foothills – be sure to get there early to enjoy the show. A display of posters crafted by Clinton County students will be available for perusing inside the Clinton County Courthouse halls throughout the weekend, beginning Friday morning. Two of the most popular contests ever featured by the Foothills Festival Planning Committee, the Lego Building and Pumpkin Decorating, return to this year’s schedule and registration and set-up for the 2018 editions begin at 1:00 p.m. at the Foothills Festival Building. Get registered before 5:00 p.m.
One of the new events on this year’s Foothills schedule is provided by the Clinton County Community Foundation and combines a look at some of Clinton County’s history and performing arts. A series of storytelling productions sponsored by the Foundation will be held in front of Dyer Drug on the north-east corner of the courthouse square, featuring local actors Donovan and Amanda Hatfield with Chris Dickens of Burkesville. With an initial performance at 4:00 p.m. featuring stories titled “Speaker Interrupted” and “A Lincolnite is Dead” a second performance on Friday will give an after-dark and Halloween setting for “Bigfoot Sighting,” and “The Ghost of Champ Ferguson” at 6:00 p.m.
At 5:00 p.m., expect all eyes to be pointed toward Cross Street for the “best little parade for miles around”, the annual Foothills Festival Parade. Going along with this year’s Foothills Festival theme that plays homage to all of our heroes in and around our little community, military and otherwise, this year’s parade will honor “Heroes of the Foothills”. Lineup for the parade at Westview Shopping Center will begin at 3:00 p.m.
As the day turns to night, musical entertainment takes the front and center thoughts on Stage 1 with a free concert by one of the best known bands from Kentucky – Exile. Fronted at 6:00 p.m. by Kevin Dalton and The Tuesday Bloom, Exile will bring their mix of Billboard Top 100 hits from several years to the stage at 7:00 p.m.
It’s free, but bring a lawn chair, and probably a blanket and plan on nothing but good sounds and good times for this foot stomping, hand clapping concert. Friday’s entertainment closes out with a night ending fireworks show visible from the square and the entire region, with the blasting to begin at 9:00 p.m.
On Saturday, as has long been the case, there will be an early start to the Foothills excitement with the annual 5K race. Getting underway at Mountain View Recreation Park, the starting siren will sound at 8:00 a.m. (registration begins at 7:00 p.m.), and will end shortly later at the courthouse square finish line location near Dyer Drug. Come out and line the race route to keep this year’s field of runners enthused and at their best. As the day continues on Saturday, so does the lineup of Foothills events. Registration for the afternoon lineup of contests begins at the Foothills Building at 10:00 a.m., and must be completed before 12:00 noon (Hot Dog Eating, Look-a-Like, Lip Sync). The Car, Truck, Motorcycle and Tractor Show at People’s Bank and Trust Parking lot gets started with a 10:00 a.m. registration and continues until 2:00 p.m.
An event that has enjoyed growth in both entries and attendance, check out some of the best restored vehicles from not only Albany and Clinton County, but from across the region as well. Every car has a story – just ask the owner. At 10:00 a.m., with the arts and crafts and Pumpkin Patch open again and in full swing, be sure not to miss the first of several Clinton County Community Foundation presented story telling performances in front of Dyer Drug on the courthouse square. Story telling will take place Saturday at 10:00 a.m.,2:00 p.m., 4:00 p.m. and 6:00 p.m. featuring Donovan and Amanda Hatfield and Chris Dickens. The weekend’s second Foothills Parade will get underway Saturday morning at 10:00 a.m. near the Foothills Building on the west side of the courthouse square with the return once again of the popular Lil’ Red Wagon Parade for “drivers” ages 4 – 12. This year’s entries will again stay with the 2018 Foothills theme – “Heroes of the Foothills”. It’s a short parade route, and a quick to be over event, so be sure you’re on hand early to take in the sights of these mini, hand-fashioned floats and costumed participants. Enjoy the music and interactive games at the Pumpkin Patch by Dynamic Entertainment beginning at 11:00 a.m. until 2:00 p.m.
For some more musical entertainment throughout the day, check out the nearly certain to be held impromptu concerts that will pop up in the courthouse lawn, or inside the courthouse halls should weather interfere. Some of the best local musicians are certain to get together for some of the best sounds of the weekend, and since the faces and instruments change out every few minutes, be sure to make several visits to enjoy these unique shows. Another fan and participant favorite returns to the Foothills schedule this year with the Hot Dog Eating Contest near Stage 2 at 1:00 p.m..
At 2:00 p.m., the Parent / Child Look-A-Like contest with several age categories will get underway also at Stage 2. Returning for what is the longest running contest in the Foothills lineup will be the Lip Sync Contest that always packs the street in front of Stage 2 and brings the crowd to its feet time and time again with the sights and sounds and sometimes tears of laughter from the performances and antics by the performers. Don’t miss this year’s Lip Sync that gets underway at 3:00 p.m.
As the day and schedule winds down into darkness, the fun continues with two musical entertaining events. Beginning at 6:00 p.m. on Stage 1, get ready for some of the best 50s and 60s style of musical entertainment ever brought to the Foothills lineup when Olds 88 fills the air with rock and roll from that era. The younger Foothills crowd will want to find their way to the Stage 2 area for Terry Murphy’s Street Dance that kicks off at 7:00 p.m.
As this 39th edition of the Foothills Festival comes to another close, it will once again go out with a “bang” when the second fireworks show of the weekend plays out in the skies over Albany, beginning at 9:00, and bringing an end to yet another weekend of fun for Albany, Clinton County and the hundreds of guests who have accepted our invitation. 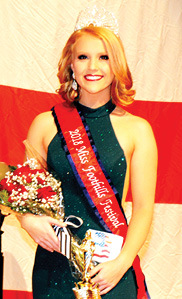 A complete schedule for this 2018 Foothills Festival appears this week on page X and of course next week’s Clinton County News will be chock full of photos and lists of winners from the weekend celebration. Bring a jacket, some comfortable shoes and maybe even an umbrella, along with your appetite and your anticipation for some fun. Take in the music, check out the arts and crafts and certainly try something new from the food court. Most important of all, say hello to some friends, old and new, some who you saw last week, others who you haven’t seen for perhaps – well, since last year’s Foothills Festival – or maybe even longer. Join in the fun and be sure to find your way to Albany to join with the hundreds of others who will take in the fall celebration to . . .